Crayola is a leader in the worlds of arts and crafts around the world and the name you can trust for 100% kid safe arts and crafts innovations. 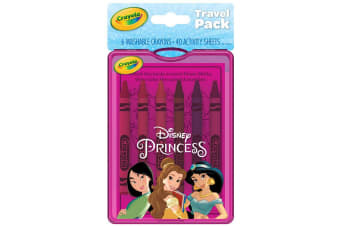 Crayola Disney Princess Travel Pack contains 6 washable crayons and 40 Disney Princess colouring in sheets. 6 colours in super bright Crayola colours mean that every colour need is covered. Washable, of course ! 40 activity sheets with different scenes from your child’s favourite Disney Princess show are included. Includes a handy plastic carry case with handle for easy transport on the go. The Crayola Disney Princess Travel Pack is perfect for keeping your child artist amused whilst travelling.